Visit John Stolarczyk's web site, The World Carrot Museum (www.carrotmuseum.com) and you could find anything from a photo of the world's heaviest carrot to articles about antifreeze-and even lasers-made with carrots. Stolarczyk, 51, lives in a two-story stone house in Skipton, North Yorkshire, England, where he started his e-museum for the general public in 1998 after visiting a variety of museums, castles and churches with his family and taking an interest in the incredible diversity of collections available for public viewing. "We reckoned we'd seen or heard about a museum or collection for just about everything and that any subject could be made into a successful museum-even an innocuous item such as a carrot," he recalls. "Then we got to thinking some more and, on further investigation, could not find one related to carrots. So we decided this was it-the ideal project-to learn about web design and create something interesting and worthwhile. We always knew how healthy carrots were and decided to spread the word." Fulfilling his fundamental aim to" inform, educate and entertain," John has collected information about carrot history, wild carrots (Queen Anne's Lace), carrot varieties available today, the many varieties of orange carrots currently in commercial use around the world and even carrot tattoos. He has provided a kind of primer for carrot gardeners, a compendium of carrot trivia, and, of course, a page outlining the healthful benefits that can be derived from eating carrots. "Carrots are nutritional heroes," he reports. "They store a gold mine of nutrients. No other vegetable or fruit contains as much carotene as carrots, which the body converts to vitamin A." In addition to beta carotene, which gives carrots their orange color and which the body converts to vitamin A, carrots also provide vitamins, E, and C, as well as vitamin B6, thiamine (B1) and folic acid from the B-complex. Carrots are also a rich source of minerals such as potassium, magnesium and copper, according to John's web site. "They also contain, in smaller amounts, essential oils, carbohydrates and nitrogenous composites," he reports. "They are well known for their sweetening, anti-anemic, healing, diuretic, re-mineralizing and sedative properties. Carrots are credited with many medicinal properties. They are said to cleanse the intestines and to be diuretic, anti-diarrheal and an overall tonic. Carrot is rich in alkaline elements which purify and revitalize the blood." In the section on Carrot Trivia, Stolarczyk has included a photo of Alaskan John Evans and his world-record carrot, a root mass weighing in at 18.985 pounds. Curious visitors to the e-museum can also see other giant vegetables he has grown organically in "the land of the midnight sun" and even e-mail him at evansjvr@mtaonline.net. "I've been gardening organically for over 40 years," says Evans, who is originally from Ireland. "I've gardened everywhere from India, Belgium, Minnesota, Montana and Arizona to Alaska, wherever I've been." Evans classifies himself as "a wanderer" who has moved about as a mechanical designer. He says large carrots like his record whopper develop huge root masses to take in all the nutrients they possibly can, sometimes being mistaken for several carrots that have grown together. "I've had a lot of comments saying, 'Oh, it's a lot of multiple carrots all in one," Evans reports. "But I had it all verified by the top agronomist in Alaska and it is just one carrot. They always come out like that. In order for it to put on that much bulk, it has to have enough root system to accumulate that size." Evans is known for growing giant vegetables, but he also should be renowned for his research on organic agriculture. He recently developed a unit that creates "compost tea" in about three days that can be sprayed, injected or side-dressed on crops to boost soil fertility and enhance growth. "You put the ingredients together and plug it in and within three days, you have soup," he explains. "I've got documentation that plants will grow three to four inches overnight." Is Evans' compost tea something commercial vegetable growers could apply? "Absolutely," he says. "I've just got a contract with the Palmer [Alaska] municipality to make up a 2,000-gallon brewing unit so they can feed the soccer fields, parks and everything-hundreds of acres." A closer look at the trivia on Stolarczyk's web site will reveal two collections of carrot memorabilia and artifacts, one of which was featured in a recent issue of Carrot Country magazine. The Carrot Museum features photos and information about Jeffery Chiplis of Cleveland, Ohio and his collection of carrot bags, but also notes that Romana Zawarti has accumulated a collection of more than 1,200 carrot artifacts including mugs, artwork, toys, birdhouses, underwear and a toothbrush. "Her husband, Charles, has even given her three carrot rings," according to Stolarczyk. Romana began collecting carrot items almost by accident in 1993 while on vacation in Maine with her husband. Looking for a collectible to buy, she noted that "everything is blueberries," in Maine and wanted to find something different. "I don't fit a mold," she laughs. "So if everybody's doing blueberries, I have to be different. I went to a shop and bought two porcelain carrots. And that was it. There was absolutely no plan, no idea of where it was going to go. Over the next two years, I ended up with a few more. They were in the kitchen. Then some people got me some and I realized at about 100 that I was going someplace with this, not knowing where. I started numbering them and logging them. "I decided I needed to be very pure. I did not want bunnies attached or other vegetables. Then I moved them to their own room. That was while we were still living in New York." Today, Romana and her husband own Armistead Cottage (armisteadcottage.com), a bed and breakfast in Providence, Rhode Island. On their web site, the two feature photos that Charles took of Romana's "carrot room." "It's easy to find my bed and breakfast," Romana continues. "I have this four-foot carrot on my porch. It didn't fit in the collection." She adds, "Now, I could never stop collecting carrots. They really are cheery. You walk in that room and you don't know what to say. Our guests take pictures in that room. They totally love it. They have never seen such a collection. I'm up to more than 1,230 pieces. My guests don't leave thinking of carrots the same way." New to the World Carrot Museum is information about another carrot enthusiast: Susan Johnson, who specializes in carrot plates; and, coming soon, David Coulson, another carrot bag collector, may soon have a link, too. His web site is www.davidcoulson.com. Another carrot collector featured at the museum is Caroline Hoyt. Elsewhere in Stolarczyk's e-museum, you can find out how Queen Anne's Lace got its name, the meaning of both words, Daucus and carota, that make up the scientific name for carrot, and how Mel Blanc, the cartoon voice of Bugs Bunny, really felt about carrots. If carrot bags, art and bric-a-brac aren't enough, you can click on a link and dispel forever the myth that Blanc was actually allergic to carrots. Not so. In his autobiography, That's Not All, Folks! : My Life in the Golden Age of Cartoons & Radio, Blanc, wrote, "I don't especially like carrots, at least not raw. And second, I found it impossible to chew, swallow, and be ready to say my next line. We tried substituting other vegetables, including apples and celery, but with unsatisfactory results. The solution was to stop recording so that I could spit out the carrot into a wastebasket and then proceed with the script. In the course of a recording session, I usually went through enough carrots to fill several. Bugs Bunny did for carrots what Popeye the Sailor did for spinach. How many lip-locked, head-swelling children were coerced into eating their carrots by mothers cooing, '. . . but Bugs Bunny eats HIS carrots.' If only they had known." You may also be interested to know that Howard Hughes measured every carrot he ate and that Indian women in Rajastan eat carrot seeds as a contraceptive. China is the world's most prolific carrot producing nation, turning out 274.9 million tons of carrots annually and Grimmway Farms processes 10 million pounds of carrots a day, according to site. At the World Carrot Museum, there is something for the whole family, including a carrot jokes, puzzles, fun experiments for kids and a women's page. For the science-minded, Stolarczyk points out carrots have many uses. He offers an article on plant biologists at the University of York in England who have isolated the first plant antifreeze protein from carrots. "Antifreeze proteins act in a different way to the antifreeze you put in your car radiator," according to Maggie Smallwood, the senior scientist involved in the project. "These proteins specifically bind to ice crystals and stop them from growing." The scientists showed that extracts from carrots that had been growing under cold conditions could prevent ice crystal growth and went on to purify the protein that kept the crystals small. They even identified the gene that encodes the protein and transferred it to a model plant that does not normally express antifreeze activity, proving that other plants could also stop ice crystals from growing. Since most damage that plants sustain when they freeze is due to ice crystal growth, regulating that growth may help carrots survive the winter in the ground and could enhance the quality of frozen foods, too. Transferring the gene to other plants may improve their frost tolerance. Under the heading "Carrots make excellent lasers," Stolarczyk highlights the work of Hiroshi Taniguchi, a Japanese researcher, who dips carrots and other vegetables into fluorescent dye and blasts them with a laser beam of light to make them glow. He calls the result a "multiple light scattering laser or random laser," and the science behind these eerily glowing vegetables may shed light on our understanding of the universe, according to Stolarczyk's web site. Cook frozen carrots in a microwave and sparks will often fly. This "microwave effect" was a subject that caught the attention of Pulitzer Prize-winning columnist Dave Barry and is explained in detail in the World Carrot Museum. Because carrots are a dense vegetable with a high mineral content (iron, magnesium, etc. ), microwaves reflect or bounce off the metallic materials to create an "arcing effect," according the web site. Since arcing can damage the oven, frozen carrots should be "defrosted" in the microwave before cooking or should be warmed on a stovetop. You'll find all of these subjects and more by visiting www.carrotmuseum.com on the World Wide Web. And, of course, John says if you have anything of interest to add to the museum or if you're a collector, please e-mail him at carrotmuseum@hotmail.com. 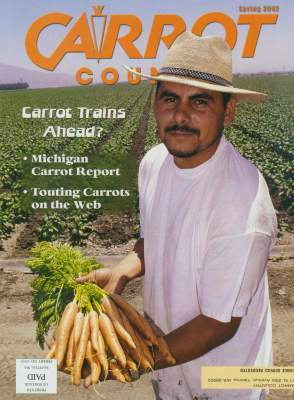 Read more about Carrot Country Magazine here.